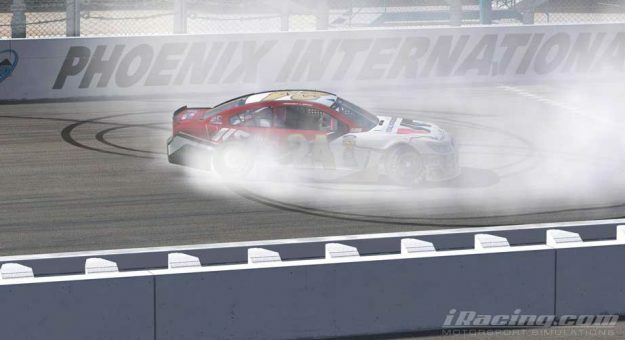 Keegan Leahy dominated the NASCAR PEAK Antifreeze iRacing Series race at ISM Raceway in Phoenix, leading 140 of 156 laps after starting from the outside pole. A flurry of cautions near the end of the race led to a four-lap shootout with Leahy leading the field to the green. He easily held off Jimmy Mullis and captured his first win in the series. Mullis was second while 2017 series champion Ryan Luza came from 38th to finish third. Darik Bourdeau finished fourth and Dylan Duval rounded out the top-five finishers. Even with the dominating car, pit strategy was pivotal in Leahy’s victory. A caution on Lap 142 brought most of the lead-lap cars down pit road with several, including Leahy, opting for two tires to gain or maintain track position. Leahy would restart third behind Brad Davies and Alex Bergeron, both of whom did not pit. On the restart, both Davies and Bergeron spun their tires, stacking the pack up behind them. Then, Davies slid a bit wide in Turn 1, which allowed Leahy to stick his nose in and complete the pass with only slight contact. Davies’ slide up the track caused another stack-up and led to Bergeron getting turned off the bumper of Nick Ottinger. The wreck would collect several cars and hurt drivers like Michael Conti, who had taken four tires during the last stop. Conti started on the pole and looked strong early, but his car faded a bit during the middle of the run, allowing Leahy to pass for the lead. As the run went on, Conti’s car came back to him and he found himself running second or third for much of the race. However, his four-tire pit call cost him track position, resulting in an eighth-place finish. Eight cautions slowed the field for 32 laps, giving drivers plenty of chances to adjust their cars. Even with the cautions and subsequent restarts, passing proved difficult as drivers could run a higher, defensive line even in Turns 3 and 4. Leahy’s win, combined with a top-five result at Daytona, makes him the early points leader with just two of 18 races complete. He holds a 10-point margin over Ottinger and Conti. Ray Alfalla is another three points back, an impressive feat considering he had to make an extra pit stop under caution and restarted 33rd on Lap 116. Forty laps later, Alfalla found himself in sixth place at the checkers after slicing through most of the field and taking two tires on his final trip down pit road. Duval rounds out the top five in the standings. Week 3 takes the NASCAR PEAK Antifreeze iRacing Series to Auto Club Speedway, where drivers should find plenty of room to pass as opposed to the tight confines of Phoenix. Last season saw Ryan Luza grab the pole and win in what became a familiar sight in the 2017 season. Can anyone keep pace with Luza as the series visits the first downforce track of the season, or will Luza still be the one to beat? Find out in two weeks’ time on iRacing Live!